Alex Mitchell hits out during his swashbuckling innings of 45 from 37 balls for Peterborough Town against Rushden. Captain David Clarke has issued a 100-point target for Peterborough Town in the rest of the Northants Premier Division season. Town beat reigning champions Rushden at Bretton Gate last weekend to keep alive their faint hopes of winning a fourth title in five years. The city side are now third, but 44 points behind long-time leaders Old Northamptonians with just five matches to go. That means there are only 100 points available for Town, but Clarke believes claiming every one of them will be good enough to win the league. “I honestly believe we will finish top if we win all five matches,” Clarke stated. “We have a couple of tough games left, including against the curent top two (ONs and Finedon), but we proved on Saturday we can beat the best teams in the league. 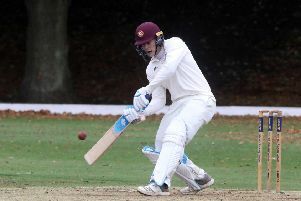 “Old Northamptonians are having a great season, but they have some tough fixtures left and they will feel the pressure if they see us coming up behind them. Fast bowler Jamie Smith is available after a two-week break. He is attempting to knock either young all-rounder Mohammed Danyaal or experienced slow bowler Richard Kendall out of Town’s line-up for a game at Northampton Saints on Saturday. Saints drew at Bretton Gate earlier in the summer, but it’s a game Town will expect to win on a wicket that is usually good to bat on. “We’ll try and get a big score and put the pressure on them,” Clarke added. Remaining games: ONs v Rushden (a), Saints (h), Rushton (h), Town (h), Finedon (h).